drink the good stuff! : Send it back! Harvey Steinman of Wine Spectator recently penned a post about ordering wine at restaurants. The question, he contends, is not whether the wine is faulty but whether or not you like it. I beg to differ on that. When a waiter presents your wine and uncorks it at the table, it is not a taste test. It’s not like you can order the porterhouse and have it prepared for you only to send it back, exclaiming, “I don’t like this. Please bring me the pork chops”. If the porterhouse is undercooked then it warrants a trip back to the kitchen — but it is pretty much your problem if you simply ordered wrong and don’t like it. Unfortunate, yes, but you have to take some responsibility for your decisions. Am I wrong here? What is frustrating, for an avid wine lover or even a professional, is that some wines do not taste distinctly faulty at first but upon further inspection are clearly flawed. I have made this mistake many times and what it has taught me is that you have to trust your instincts. If a wine gives you pause and you do not have any prior experience with the wine you can ask the waiter or sommelier what the wine is supposed to be like. This way you can determine whether the wine is not quite right or if it is merely the wine’s style. Coming to the conclusion that the wine is faulty after downing half a bottle is bound to ruin your mood and maybe even your dinner. Restaurants and waiters have widely differing attitudes towards customers that send back wine. Don’t let them intimidate you. After all, they don’t know who you are and what you know (even if it’s nothing!). Trust your instincts and send a questionable wine back, event if you have to ask for another minute to evaluate it. The Winemonkey and I have come across many situations where we wanted to kick ourselves for not sending a bottle back. Situations have ranged from bottles we realized were not quite right after they were half gone (although they were certainly suspect right off), to bottles that the sommelier actually talked us out of sending back (oh, it’s just Brett, is it?). For those of you who are intimidated by the entire ritual of “testing” the wine for the table (and you have every right to feel that way), remember that your first objective is to confirm that you are being presented the right bottle from the correct vintage. Your second aim is to decide whether the wine is sound. If you are confident and assured, you’ll do just fine. If there is a question in your mind, by all means send it back! If you have a restaurant wine story to share, we would love to hear it. Send us a quick note in the comments section. 1. You order a wine you know and it isn't right. It goes back. If you suddenly realize it isn't what you wanted, tough! 2. You have a discussion with your sommelier and s/he recommends a wine. You taste it, it isn't flawed, but it is nothing like what you wanted. It goes back. In fact, I usually pre-negotiate this now: "If we don't like it you'll drink it, right?" Wow. These your past two post really hit home with me. The trick is the sommilier or waiter should have the knowledge of the wine he or she is selling and the experience at the table should be interactive. The server should ask what the custumer is into :red, white, light, medium or full bodied. Is it cold and they want a deep dark red? Is it hot and they want to wash the day away in rose or a vermentino. Isit celebrtory and they want to do a prosecco or a cava? I always try to talk to the customer and try to customize the bottle to their needs and always, always show them, the wine before opening it. I tell them the vintage and indicate other iformation about the wine that we have discussed. When they try it I always ask them to be honest. If it is not right I will try it immediately and won't hesitate to bring it back. I can sometimes tell when serving a bad bottle because I always smell the cork befor serving the initial taste. 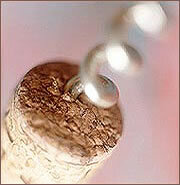 Corks can be decieving but not always. This all takes a minute or two and if you are wel organized it won't take you away from other customers. It is possible to make people feel comfortable about what they choose.It just takes a little bit of pride and knowledge of what your selling. Wow. I just went off on a major rant. Excellent subject.